The Linksys smart switch (LGS308, LGS308P, LGS308MP, LGS318, LGS318P, LGS326, LGS326P, and LGS326MP) offers a quick and easy solution to extend your office network. The smart switch features gigabit speed ports, a web-based setup page for easy configuration and management, and PoE+ support for networking devices to be located anywhere without the need for alternating current (AC) outlets. IMPORTANT: Before using the web-based setup page, you need to know the IP address of the switch. The switch is a DHCP client by default. If there is no DHCP server on your network, the default IP address of the switch is 192.168.1.251/255.255.255.0. Use Cat5e cables to connect both the switch and your computer to the network. Set an IP address on your computer. a. If you don’t have a DHCP server, select a unique (not already in use) IP address in the range of 192.168.1.1-192.168.1.254 and assign it to your computer. b. 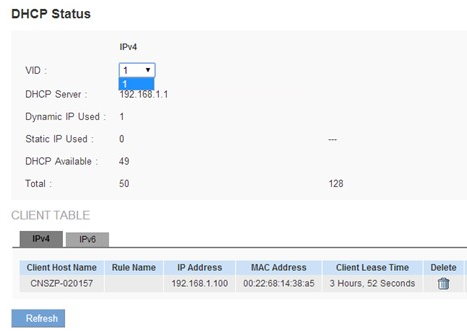 If the IP address assignment is by a DHCP server, access the DHCP server to verify the IP address assigned to the switch. Open a web browser on your computer then enter the IP address of your switch. Enter “admin” as the default username and password. a. Log in to the router’s web-based setup page. To learn how, click here. b. Click Configuration tab from the header area. c. Click DHCP on the left panel. e. On the CLIENT TABLE, in the MAC Address column look for the MAC address of the switch (it should match the one printed on the switch's box). Beside it, you should see the IP address that has been assigned to the switch. The System light is solid blue if the switch using an IP assigned by a DHCP server. If it is using the factory default IP address, the System light will blink blue. Identifying the VLAN ID (VID) of the port where the smart switch is connected to is essential since the port VID will determine the IP address of the switch. Also, make sure to choose the correct VID from the drop-down arrow in order to generate the correct DHCP client table.